Adelaide - The Proteas remain optimistic about saving the second Test match here, despite all indications pointing towards an Australian victory on the final day. Holding out for the draw will take a true test of character and resilience from the last seven batsmen, with AB de Villiers and Faf du Plessis already showing a strong example of defiance at stumps on Sunday. “There is still hope,” assistant coach Russell Domingo said. 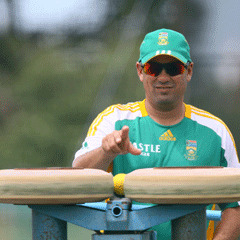 “South Africans pride themselves on their resilience, we are a side that will fight right through until the end. We know that we are under pressure at the moment but there is every possibility that something special will happen tomorrow. It is an opportunity for someone to make a major play for their country. Winning the match is close to impossible, and putting up the defence of a Trojan army will be the modus operandi for the 90 overs scheduled for the final day. “We have to be as positive as we possibly can be in defence tomorrow but we know that 370 on the last day with four wickets down is probably out of the window,” Domingo added. Jacques Kallis is the next batsmen in at No 7, and showed with apparent ease in the first innings that he can overcome the challenge of batting with his hamstring strain.